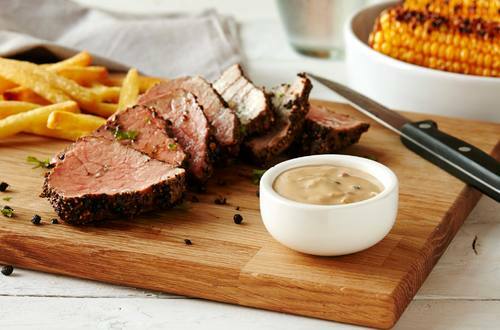 A great peppercorn sauce recipe enriched with the smooth texture and great taste of Hellmann's® or Best Foods® Real Mayonnaise. Serve with your favorite steak for a delicious meal. 1 Melt Country Crock® Spread in medium saucepan over medium heat and cook shallot, stirring occasionally, until tender, about 3 minutes. Add garlic and cook until golden. Add brandy and bring to a boil over high heat; boil 1 minute. Reduce heat to medium and stir in remaining ingredients. Reduce heat to low and simmer, stirring occasionally, until sauce is slightly thickened, about 5 minutes. Strain, if desired. Serve with your favorite steak.